Twitter Become the best place for Hackers to Leak data now and the best part is that , Twitter will never block you for such actions. After Lulzsec, Anonymous .. now Pakistani Hackers Group "TeaMp0isoN" is back with some New leaks. Last time they claim to deface the website of one Lulzsec team member. 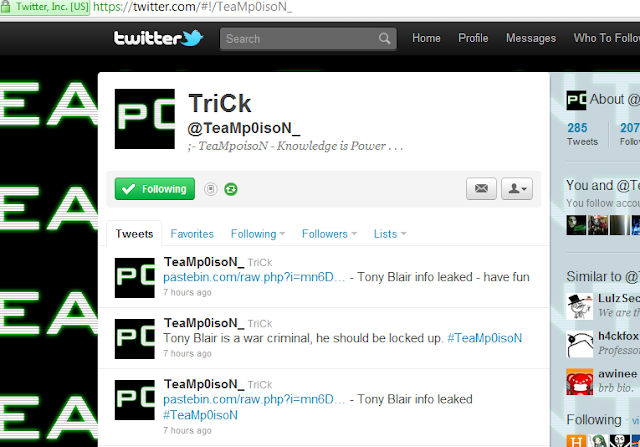 This time TeaMp0isoN leak data of Former British PM Tony Blair via there Twitter account. The Leak is done via pastebin post, which includes personal information on former British Prime Minister Tony Blair, including the contents of his electronic address book, with contact data for members of Parliament and for what could be Blair's dentist and his mechanic. TeaMp0isoN also tweet that "Tony Blair is a war criminal, he should be locked up." 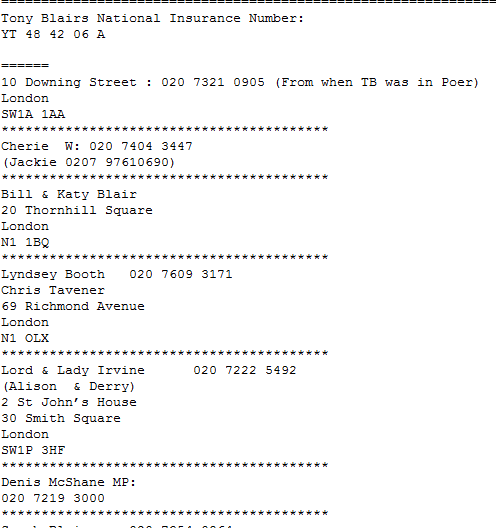 The contact list appears to be from when Blair was prime minister and includes a phone number for 10 Downing Street. According to Hackers "THE INFORMATION IN THIS ARTICLE WAS OBTAINEDIN 2010 DECEMBER, WE STILL HAVE ACCESS TOTHE WEBMAIL SERVER, PHONE NUMBERS MAYHAVE CHANGED BUT ALL THE INFORMATION IS100% LEGIT."